Fête en Blanc is a celebration, party, or dinner in which people flash-gather in a public space and set up a temporary, chic dining area. The concept was started in 1988 when Frenchman François Pasquier invited a group of friends to an elegant outdoor dinner, revealing the public location only at the very last minute. This creative tradition has now spread all over the world, with these chic summer gatherings occuring in town squares, at public landmarks, in graveyards, ballparks, etc., while the more intimate ones are held in backyards. Guests dress head to toe in white, and the tablescape is elegantly set, all in white. 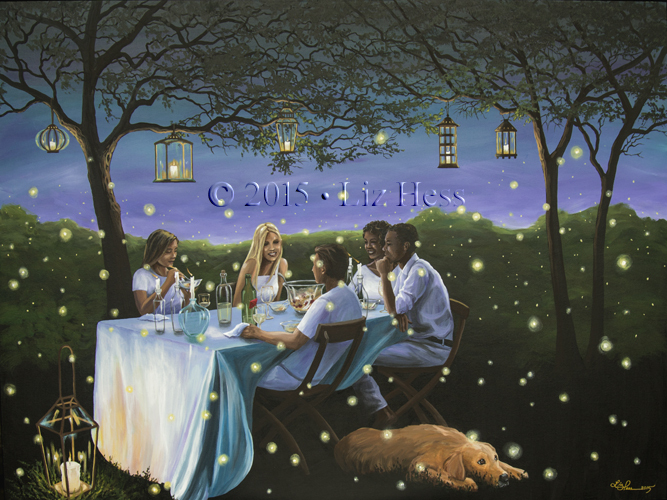 In this painting, Liz wanted to capture the magic of firefly season which occurs each evening at dusk (the magic hour) in Lancaster County during the month of July. SKU: N/A. Categories: Available Originals, Dogs (only) Collection, Firefly Collection, Red Umbrella Collection.